The AWS factory – AWS Shopper (A.W.S = Automobilwerk Walter Schätzle) was a German Automobile manufactured in West Berlin, in Rudow (at the borders of West Berlin with East Berlin and 3/4 of its boundaries were crossed by the Berlin Wall from 1961 to 1989 ) from 1973 to 1974. The first car was shown in 1970 and a few hand-built cars were made, but series production begain in 1973. 1700 were made. 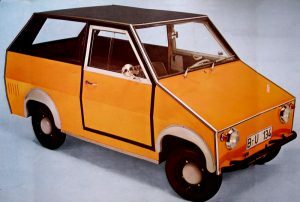 The car – The AWS Shopper’s internal design was unique, the frame was made with square steel tubes connected by special angular brackets, and the shell of the car was made from plasticized sheet metal panels. This meant that fixing the car was simple. Many Goggomobil parts were also used. Perhaps the AWS Shopper was intended to give East German defectors – used to driving Trabants – something to ease their transition to the West. Like the Trabant, the AWS Shopper uses a two-stroke engine of socialistic displacement. The 293cc twin produces a newborn kitten-weak 15bhp, and even with the car tipping the scales at a bantam 947lbs, that’s still a monumental 63 pounds each cv has to drag around. Mechanical information – Model name: Shopper, Years produced: 1971-1974, Length: 3,070 mm (120.9 in), Width: 1,380 mm (54.3 in), Motor: Glas 2-stroke Cylinders: 2 , Displacement: 293 cc, Horsepower: 15, Top speed: 55 mph (89 km/h). 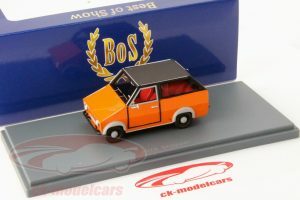 Diecast Model – A good model is produced by BoS Model in 1/43 scale.